When Big Sister E was born, I found out right away that there were some aspects of motherhood and having an infant that worried me much more than others. I didn't make every visitor wash their hands when they came over and I wasn't overly freaked out about whether she was getting enough to eat. However, the thought that was always, always on the forefront of my mind was how I was going to keep my precious bundle safe from SIDS. Having read plenty about Sudden Infant Death Syndrome while pregnant, I don't think there was a pillow or blanket within 20 feet of Big Sister E anytime she was in her bassinet or crib. In fact, I don't think she had a blanket on her bed until she was well over a year old, as I just couldn't shake the images in my mind of not being able to live without her if something happened. The result? Big Sister E is now a happy, healthy, thriving almost-4-year-old... that had to sleep through multiple winters where she was probably a little cold. Had I known back then about HALO Innovations and their innovative line of SleepSacks, they would have been the answer to all of our problems and my concerns. Founded by a father of four, William Schmid, after having spent years researching sleeping environments after losing his daughter to SIDS, HALO is fully committed to providing a healthier and safer sleep environment for children of all ages. As well as their collection of unique and amazing products, their site is filled with information for parents, hospitals, childbirth educators and from experts on ways to keep all babies safe. While browsing all of the great options available, I marveled at how much the SleepSack Swaddle would have come in handy for the early months in both of my daughters' lives. Not only would they have had the comfortable and roomy sack blanket (we LOVED using these), but the fact that the adjustable swaddle feature can later be removed makes it two products in one. Instead of having to purchase swaddlers (we did) and separate sleepsacks (we also did), the SleepSack Swaddle works for an extended amount of time to keep babies safe, warm and sleeping soundly from birth to around six months. However, just because my daughters are a little older doesn't mean that there isn't a HALO product for them. 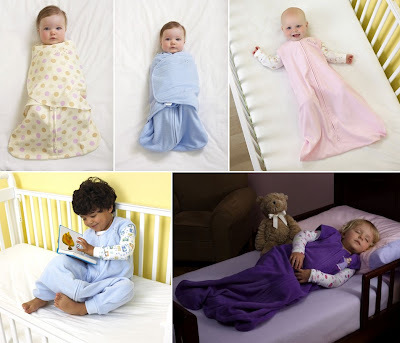 In fact, the SleepSack Wearable Blanket comes in so many styles and sizes that children from birth through age five can enjoy them. But I don't think enjoy is the right word for us. My daughters have ADORED the HALO Micro-Fleece Big Kid's SleepSack Wearable Blanket from the day it arrived. Not thinking that this was something that Big Sister E would be interested in, I chose the 2T-3T SleepSack Wearable Blanket for Little Sister B but have found that it fits them both perfectly fine. As Big Sister E is slightly over the height recommendation, her feet do stick out the bottom and remain uncovered, but she doesn't seem to mind that one bit (and proceeds to wear it around the house for as much of the day as possible). 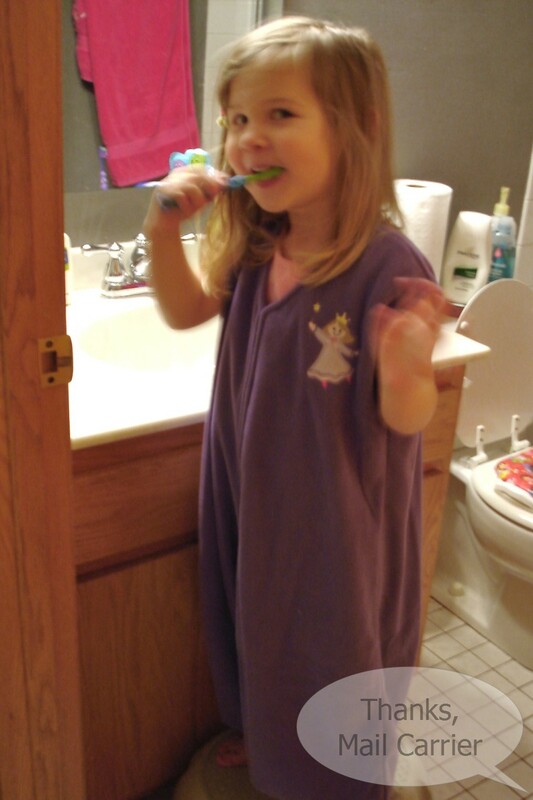 When it's her turn, Little Sister B is also really happy in the SleepSack Wearable Blanket. The fact that it is warm, soft and nonrestrictive make it just the thing to keep her cozy now that the temperatures have dropped yet still have free range of motion. As the strong zipper on the front zips from the top down (the opposite of a traditional zipper), there is no chance of the metal bothering her neck or chin and Little Sister B doesn't fiddle with it at all. The soft, stretchy cuffs on the bottom keep the sack portion in place but allow her feet to be well-ventilated and able to move into her favorite sleeping positions. 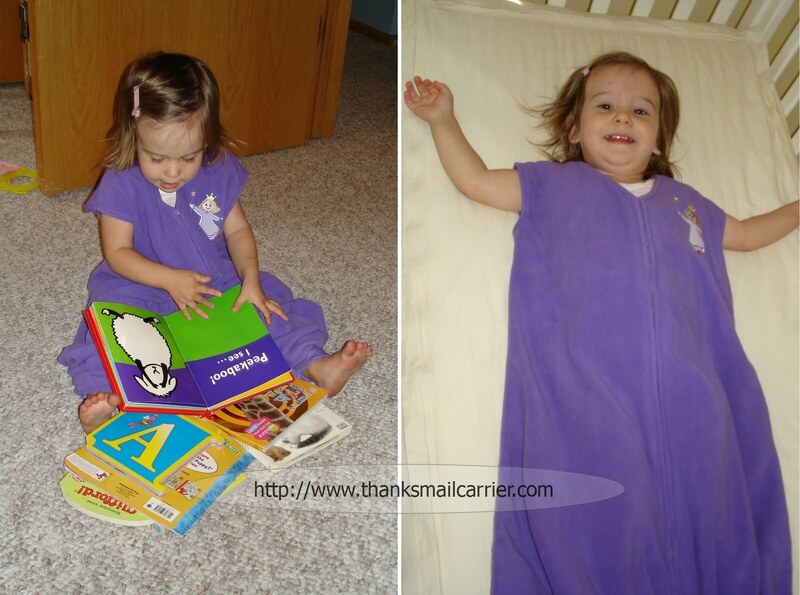 Whether she is reading books or lying down to go to sleep, this truly is a great way to keep a child comfortable, content and able to get a good night's rest. Which, really, benefits the entire house. Whether just starting out with a newborn or trying to keep your toddler from kicking all their blankets off and then complaining that they're cold, HALO Innovations has an item to make sleeping a safe and comfortable time for the whole family. Even better, as well as a variety of online and in-store retailers like Babies 'R Us, HALO is now exclusively available in Target stores! Check them out the next time you're there! One lucky person will win a HALO SleepSack Swaddle, SleepSack or SleepSack Wearable Blanket! ARV $29.95! To enter to win: Visit HALO and tell me which of their adorable and innovative item(s) are your favorite. 3 Extra Entries if you blog about this giveaway linking back to Thanks, Mail Carrier and HALO Innovations. Please leave an address where it can be found. Giveaway will end on October 1st at 11:59pm CST. Do me the favor of leaving an email address or making absolutely sure it is visible in your profile, I have to have a way to contact the winner. The winner will be chosen by random.org and announced here as well as emailed and will have 48 hours to contact me or respond to notification or a new winner will be chosen. This giveaway is open to residents of the U.S. and Canada only. A big thank you to HALO for providing a SleepSack Wearable Blanket for review as well as a SleepSack product of choice for one lucky giveaway winner. The opinions shared are my own and honest and if you really need to see more, click here to see how I roll. I loved loved loved these when my kids were little!!!! Funny thing...I just reviewed one of these (post hasn't gone up yet) and I didn't even realize they made them for bigger kids! How cool! The sleepsack swaddlers are my favorite. We've used HALO products since day one, I think my guy is finally big enough to graduate to the Micro-Fleece Big Kid's SleepSack® Wearable Blanket in the car print! I would love to have the 100% Organic Cotton SleepSack Swaddle. My baby will only sleep in his sleep sack, but the one we have is fleece and he gets so hot in it, and it's getting too small. I'd love to have a cotton sleep sack for him! Follow HALO Innovations via Twitter. Left message on their FB Wall. Entered The Baby Store Plus Giveaway. Entered Target/Box Tops For Education Giveaway. I like their 100% cotton Sleep Sacks! I entered your Snack & Play Tray giveaway. I entered your Zoobie giveaway. I entered your I Play giveaway. I like the 100% Cotton SleepSack® Swaddle. I entered the Amazon Gift Card giveaway. I like the starter kit for a friend. I entered your Magneatos giveaway. Sleepsack Swaddle is our favorite! The blue dinosaur and fuchsia butterfly micro-fleece sleep sacks have our kids' names all over them! I like the Comfort Mesh Early Walker sleep sack. I entered the Chic Monkey boutique giveaway.